What is "sportility?" It is a combination of sport and utility. That's a good description of these Chippewa Men's 73075 Sportility Brown Logger Boots. Sure you could buy these Chippewa boots to work in. You could also buy them for sport. Hunting comes to mind, as d ... (see full details) (see specifications) #CHP73075. What is "sportility?" It is a combination of sport and utility. 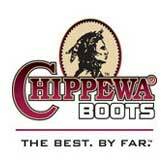 That's a good description of these Chippewa Men's 73075 Sportility Brown Logger Boots. Sure you could buy these Chippewa boots to work in. You could also buy them for sport. Hunting comes to mind, as does bird watching, playing with the retrievers, mushroom hunting, and many other outdoor sports. Let us tell you why. These men's boots are made with full-grain oiled redwood 8-inch leather uppers, soft Texon insoles, steel shanks, and 4 iron rubber/6 iron robus combination midsoles, all to give you the utmost in durability, support, and comfort. The leather is water-resistant for protection in damp early mornings in the woods. Even down to the hardware, these slip-resistant boots mean business. Non-tarnishable antique brass and heavy duty wax Sta-tied laces give the exteriors a clean, finished look you'll appreciate. The Goodyear leather Welt outsoles with Vibram yellow plug logger one-piece rubber soles are oil- and slip-resistant, and the best outsoles money can buy. Honestly. The rugged soles are stitched-not glued, therefore completely replaceable. Your favorite brown boots can remain your favorite for a very long time. And the durable soles have Hi-Tech tread designs to provide the most traction with the best durability. Chippewa Men's 73075 Brown 8 Inch Sportility Lace-To-Toe Boots. The "sportility" part is easily realized when both the "sport" and the "utility" collide in the same activity. In our busy lives, this happens daily. Our lives are complicated. We don't just work and go home anymore. We work, we play, we hunt mushrooms. Order a pair today from Working Person's Store before the season is ripe. These are every bit as good as the pair I bought 20 years ago. I had a hard time finding another pair of Chippewas the store I got my first ones closed. Thanks, Working Persons Store, for a great pair of boots. Chippewa Boots: Men's Brown Leather 73075 Sportility Logger Work Boots is being added to your cart.